It might not be the obvious choice. No, scratch that. It certainly is not the obvious choice. You’ve probably never even heard of Guizhou, China. But you need to. As someone who had been to China several times previously, I felt I could safely close the book on the country. But a surprising visit to this lesser known province started a whole new chapter for me and China. Guizhou province is in the southwest region of China, bordered by provinces you probably are already familiar with: Sichuan, Yunnan, and Hunan. Marked by distinct natural beauty, indigenous heritage, thousands of years of culture, and epically spicy cuisine, Guizhou is a microcosm of China in itself. And it’s for this reason that it should be on your radar for your next visit to China. The primary reason to visit Guizhou is simple: It’s stunning. While the capital, Guiyang, is everything you’d expect from a major Asian metropolis – sprawling fields of skyscrapers, neon lights, and a heavy tech scene – a short drive outside the city puts you at the heart of some truly spectacular natural beauty. First on any visitor’s list must be Wanfenglin or the Forest of 10,000 Peaks. This mind-blowing natural landform is a sweeping sea of rounded mountain peaks that stretch as far as the eye can see. The cluster of peaks are Karst formations that look as if they bubbled up from the earth. The massive peaks are carpeted in lush, green forest, giving an almost illustrated look. Come sunset, the sun dips behind the oblong ridges, blanketing everything in a velvety glow. Guizhou is also home to the tallest waterfall in China, the Huangguoshu Waterfall, located on the Baishui River. Ribbons of cascading water plummet 243 feet down, and 266 feet wide, into an ethereal blue-green pool below. Tucked behind the waterfall is a series of caves that travelers can explore for a literal behind-the-scenes perspective of the epic falls. Culturally, Guizhou is one of the best-preserved provinces, as well. There are 44 of China’s ethnic minority groups that live in this part of China. 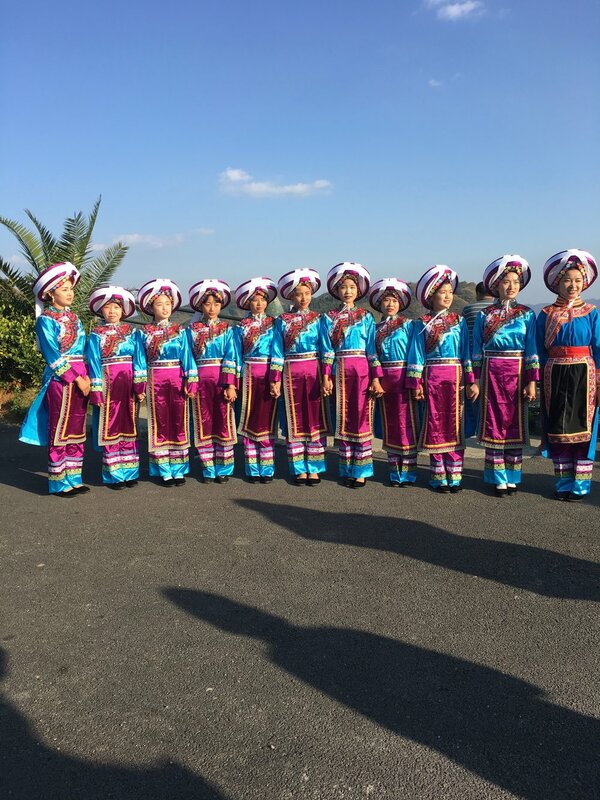 Most well known are the Miao people, and it’s possible to visit their villages across the province for a glimpse inside this unique piece of culture. Come on a full stomach, though, as the welcome ritual for foreigners in the Miao community is to feed them shot after shot of potent rice wine as they enter the village. For a spectacular combo of culture and nature, Zhenyuan Ancient Town packs a visual punch. In the eastern part of the province, this riverside Miao town has been dubbed “Venice of the Orient.” There are more than 150 scenic spots with caves, pavilions, temples, and rivers, all surrounded by towering karst mountains. Near the town is Black Dragon Cave, an ancient temple complex that spans more than 220,000 feet. Meander among temples and shrines that date back to the Ming Dynasty. And then there’s the food. Lovers of Chinese cuisine are well aware of the fiery flavors of Sichuan province, which trickle down nicely into the cooking styles of Guizhou. Unique to Guizhou is the balance of spicy with sour, so you’ll find locals mixing vinegar sauces to go alongside their tongue-numbing hot pot soup. Guizhou is also known for a heady local beverage, baijiu, which is a liquor so powerful even Hemingway might take a pass. The sheer burning sensation as it goes down is the first indication you’re about to forget everything else. So why now? Guizhou is the poorest province in China, which is likely why you haven’t heard of it. It hasn’t been marketed in the same way as Beijing, Shanghai, Xi’an, or even Guangzhou. But the government has its sights set on the capital city, Guiyang, to change that. Last year Guizhou showed the third-fastest provincial economic growth in mainland China, and has been given the nickname, “China’s Big Data Valley.” The development of Guiyang is part of China’s overall economic transition strategy and the government predicts an 11 percent increase in investment this year. With investment comes opportunity to make tourism more accessible, and that’s just what China plans to do. What this means to travelers is that access is going to become even easier. Already there are about 10 airlines that fly from the U.S. to connect in Guiyang. What’s more, a new high-speed train connects Guiyang to Guangzhou in four hours – a trip that used to take more than 20. It’s to be expected that development of Guizhou will only keep going, which is good for the destination’s economy, but with progress comes an inevitable loss of authenticity, which is why now is the time to see and to know Guizhou. This article originally appeared on Real Clear Life.